Located in the Summerland development along the west coast of Barbados, 'Emerald Pearl' is the only 3 bedroom apartment which has its own large private pool in this charming development. This luxury apartment has high quality furnishings throughout, marble floors, a fully equipped kitchen which includes stainless steel appliances, American fridge/freezer and granite worktops. There is satellite TV, Ipod docking station/CD player and Wi Fi ADSL . The living room opens up onto a 38 feet wide covered terrace for outdoor living and dining and wet bar. There is also a large open terrace with BBQ leading to the pool. The Master bedroom has King size canopy bed and opens onto the covered terrace. There is a fully tiled marble ensuite bathroom with large walk in shower and marble vanity tops. Bedroom 2 has two twin beds which can be made as a King bed and the room also opens up onto the covered terrace by the pool. A further bathroom serves Bedroom 2 & 3. Bed 3 has a King size bed. Apartment Management & Housekeeper: Our managing agents are very reliable and well established on the island. The villa manager is always contactable if there are any queries or problems. Our friendly and helpful housekeeper is also on hand six mornings per week and can always help with day to day queries. She will make the beds and change towels daily, change bed linen when required. Personal laundry is by arrangement with her and dependent upon time available. A truly lovely, comfortable apartment inside and outside with everything we could wish for. We were greeted by the delightful and engaging housekeeper, Denise, who was kind and thoughtful throughout our stay and keeps an immaculate home. The property is in a Convenient location for the beach and buses and close to a large supermarket. Although there is a lovely large communal pool, we didn't need to use it as our smaller pool was perfect for us and bigger than most small pools. It was well maintained by the friendly pool man and the charming gardener was very happy to share his knowledge of all the beautiful plants and trees that were cleverly planned so that we could have a sea view and privacy. Although we spent a lot of time outside on the patio, the inside area was beautifully furnished with a large modern tv with many channels as well as a cd music system with a selection of cds. The beds were comfortable and fitted with plenty of wardrobe space and the two bathrooms had large walk in showers. The spacious patio also had a selection of comfortable seating as well as a barbecue and the bonus of a fridge and sink. My friends and I would recommend this property to anyone and hope to return in the not too distant future. Thank you so much for your wonderful review and we are so pleased to enjoyed your stay so much in our 'home in the sun'. It is lovely to hear when guests enjoy the apartment so much and can tell others about their great experience. We do hope you return soon. Staff was wonderful!! Stanley our driver is an untapped wealth of information regarding Barbados. The property was beautiful. Even had a unexpected visit from a group of monkeys. Taxis are highly recommended and priced reasonably. Walking on the road is a bit hair raising. But you can walk on the beach to the store which is lovely. Restaurants around the villa were also fabulous. Thank you. Everybody in our group raved about our stay. Two thumbs up!! Thank you for your great review. We are so pleased you enjoyed your stay and that Stanley was such a help to you. We do hope you will be able to return soon. What can I say about this property... other than just amazing!! From the very beginning when I had questions about the location, distance from airport etc Louise emailed me back within minutes!!! She had some great recommendations and I immediately booked after speaking with her. This was a surprise trip to celebrate my husband's 40th. We're a family of four, two boys ages 4&6. We've never been to Barbados before so after reading the reviews and emailing Louise I booked this place. It was the best decision!! As soon as you walk in you realize you've made the right choice. The apartment is stunning, you feel your stress just melts away. Ms Denise, the absolutely amazing Ms Denise is there to greet you and show you around. My boys loved her and Stanley, who is worth every penny. He took us to Mullins beach, restaurants, and the fish fry on Friday. The apartment is a few minutes walk to a grocery store, it's a busy road and I was nervous with the boys but we managed. We were not impressed with the beach across from the house so we just asked Stanley to take us to another. Overall if you're looking for some place quiet, this is the place. You have everything you need in the apartment. My kids enjoyed the pool and had no desire to head to the beach. I love this place and will definitely be back!!! amazing, from start to finish! professional owners and a beautiful property and setting..
We stayed for a week in September, and had a blast! Amazing property, great location. Top driver and maid, and above all like a home away from home! Brilliant! Thank you so much for your great review. We are so glad you had such a good time and liked the apartment so much. We look forward to welcoming you back again soon. It was so hard to leave this property on the beautiful island of Barbados. Emerald Pearl was the perfect home away from home during our recent vacation. Great location, beautifully decorated, spotlessly clean, wonderful outdoor living space and the most inviting pool! Denise, the house keeper, was a so welcoming and such a delight. Louise recommended Stanley for airport transfer. We also hired him during the week for an island tour. He was prompt, courteous and knowledgeable. Honestly, we could not have asked for a better experience overall! We hope to return and will certainly share this property listing with friends and family. Thank you so much for your lovely review and we are so pleased you enjoyed our 'home in the sun' . the facilities and pool. Denise and Stanley are a great support for us and we are delighted they were able to help you and you also enjoyed their company. We very much look forward to you staying again at Emerald Pearl in the future. Nice area in St James. Close to restaurants beaches and stores. 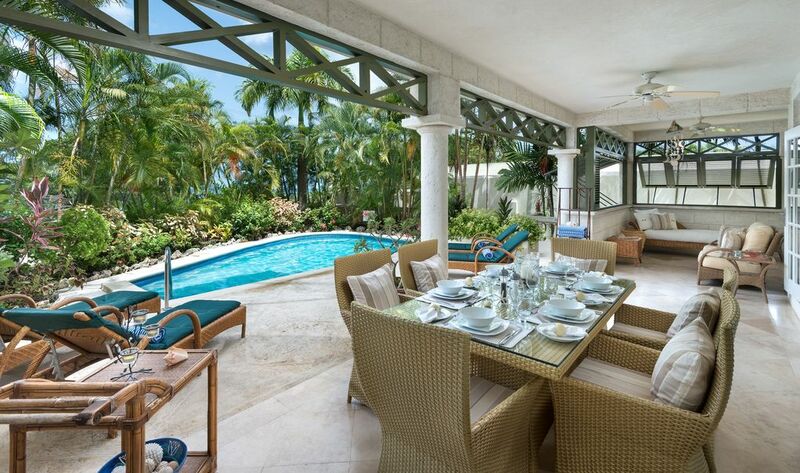 Emerald Pearl is located in the charming Summerland Development two miles south of Sandy Lane and within close proximity to many quality restaurants including The Cliff and Daphnes. Summerland is gated and comprised of two buildings, one behind the other. Emerald Pearl is located in the first building on the ground floor and has partial sea views. In addition, Emerald Pearl has a private gate leading out from the pool deck with direct access to the communal pool and jacuzzi which is also available for use by guests of Emerald Pearl. The beach is also easily accessible from here via a private pathway exclusive to Summerland residents and guests (directly across road). Private beach loungers are provided for the beach. Dedicated car parking for Emerald Pearl guests. Holetown is a short drive where many restaurants, shops, banks, supermarkets etc are located. The capital, Bridgetown is also a short drive away for duty free shopping. Golf: There are several golf courses on Barbados. Royal Westmoreland, Barbados Golf Club and Rockley are all courses where you can pay and play. Booking tee times in advance is advisable. Carts and trollies are available for hire as are clubs also if you do not wish to bring your own. **PLEASE NOTE THAT EMERALD PEARL CAN BE RENTED AS A TWO BED APARTMENT** Rates would be : Winter 2019 : £375.00 per night Summer 2019 : £275.00 per night Christmas 2019 : £550.00 per night Winter 2020 : £375.00 per night Summer 2020 : £275.00 per night Christmas 2020 : £550.00 per night Two bedroom : 1 - 4 persons Three bedroom : 1 - 6 persons The stay tax is a new legislation introduced by the Government of Barbados in March 2019. This is capped at 10% of the holiday cost.